Indian Petroleum Minister Dharmendra Pradhan is likely to visit Russia soon to sign the final agreements on Indian oil companies acquiring almost 50 per cent stakes in Vankorneft. 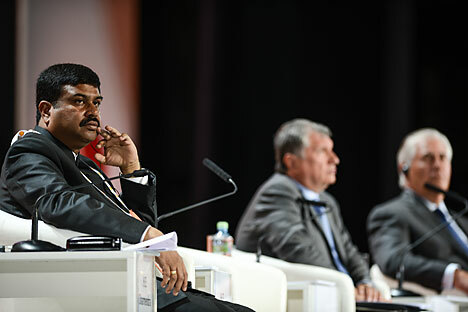 Dharmendra Pradhan, India’s Petroleum Minister, has said he is likely to visit Russia in the near future to sign a final agreement on the entry of Indian companies in the “Vankorneft” (a subsidiary of “Rosneft”). Pradhan informed Bloomberg that, after conclusion of the agreement, Indian companies would get up to 49.9% in “Vankorneft”. The total value of investment in the project is estimated at more than $5 billion. “Rosneft” and ONGC Videsh Limited (OVL) closed a deal last week to sell 15% of shares in “Vankorneft” to the Indian company for 1.27 billion dollars. In addition, the company signed a memorandum of understanding on cooperation in the Vankor field, which assumes the possibility of increasing the Indian company’s share in the project to 26%. “Rosneft” and a consortium of Indian oil marketing companies Oil India, Indian Oil Corporation and Bharat Petro Resources signed an agreement in March on the main conditions of acquisition of up to 23.9% in Vankorneft” by the Indian companies. The agreement requires concluding legally binding documents for the sale. The total share of Indian companies in “Vankorneft” could reach 49.9%. “Vankorneft” is the operator of the Vankor field in the Krasnoyarsk region of Siberia - one of the largest oilfields belonging to “Rosneft”, with a daily output of over 60,000 tons of oil and condensate. Initial recoverable reserves at the beginning of 2015 amounted to 476 million tons of oil and condensate and 173 billion cubic meters of gas. “Vankorneft” is also the operator for the development of new fields of in the Vankor cluster: Suzunskoye, Tagulskoye and Lodochnoye fields. In 2015, “Vankorneft” produced 9.75 billion cubic meters of gas and 22 million tons of oil and condensate.